Moving problem bears: Does it work? It’s all too familiar a sight in bear country: a culvert trap on wheels carrying a bear to a new home. On one hand, it’s cause for optimism — the bear is being given another chance. But it’s also evidence of a failure; another bear has come into conflict with humans and is being evicted from its home range. Will the bear simply return and become a problem again? Or if it doesn’t return home, how will the bear fare in unfamiliar territory? Starting in 1994, Parks Canada joined forces with the government of British Columbia to look at these questions in the upper Columbia River basin in and around Glacier and Yoho National Parks. Nine female grizzly bears, captured by the provincial Conservation Officer Service in human-bear conflict situations, were radio-collared and moved distances ranging from 43 km to 200 km away from the capture site. Members of the West Slopes Bear Research Project then tracked these bears for up to 7 years. At the same time, our West Slopes team followed a sample of 18 wild female grizzlies as part of a larger study looking at both black bear and grizzly bear ecology. Genetic samples from each bear to allowed us to positively identify it in the future, even if it lost its ear-tags or radio-collar. Two of the 9 problem bears returned to their original capture location (the two that had been moved the shortest distances). Both returning bears became problems a second time. Two of the 7 non-returning bears became problems in their new homes. Most of the relocated bears wandered widely and erratically compared to the wild bears. The average home range size of a translocated bear was 1053 km2, almost 8 times the home range size of a wild bear (143 km2) . In fact, they wandered so widely, it was challenging for our field technicians to find the moved bears from week to week. During the study, 5 of the 9 relocated bears died: 1 killed by another grizzly, 1 destroyed after a second move, 1 killed by an unknown cause after a second move, 1 shot by a hunter, and 1 killed by a landowner protecting his livestock. During the same time, 5 of 18 wild female grizzlies died while radio-collared: 2 killed by other grizzlies, 1 killed by an avalanche, 1 killed by a hunter, and 1 killed illegally. Because our sample size of problem bears was small compared to wild bears, having nearly equal numbers of deaths translated into higher observed annual mortality rates: 39% for the relocated bears compared to 11% for wild bears. This mixed success in moving grizzlies underscores the need to address the conditions that cause bears be labeled as problems in the first place. 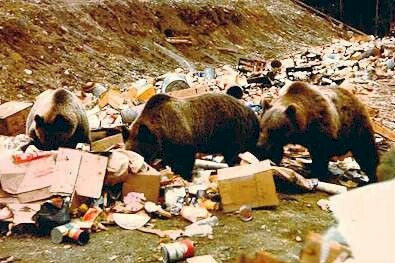 Food is a powerful bear attractant and garbage management is a central issue both in and out of national parks. Together with our provincial partners Parks Canada supports initiatives like Revelstoke’s Bear Aware Society (http://revelstokebearaware.org) to help focus public attention on ways to avoid creating another displaced bear.